The University of New Mexico School of Law provides programs designed to develop competency for mediating a broad variety of disputes, including workplace, business, family and community. Training tools include mediation simulations and debriefings, professional demonstrations, videotapes, small and large group discussions and guest speakers. During the simulations, students are coached by some of the best mediators in New Mexico. Classroom focus is on analysis of the mediation process, managing conflict, and conflict and communication theory. UNM Mediation Training emphasizes interpersonal communication skills in a problem-solving context and is not limited to those in the legal field. Anyone who is interested in mediation is welcome to attend. In the past, educators, social workers, psychiatrists, psychologists, doctors and nurses, Realtors, human resources professionals, small business owners and managers have benefited from this training. 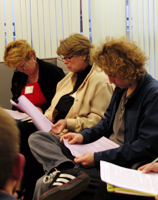 Instructors are skilled and take a practical approach to teaching mediation. They are also experienced practitioners themselves, with more than 40 years of combined experience mediating in a wide variety of disputes. In addition, the courses have consistently received the highest ratings by practicing attorneys, judges, psychologists and social workers who have attended.